With holes blown into the wall, damaged appliances, losses of hundreds of dollars, unanswered phone calls, and nasty odors that fill up the entire house, one can only wonder, what kind of nightmare is this? Well, it might be the case of having a horrible tenant. Once the lease agreement is signed and keys are exchanged, we can only hope to go on our own merry way. Unfortunately, it’s not always a walk in the park when it comes to dealing with bumpy situations regarding unpleasant tenants. 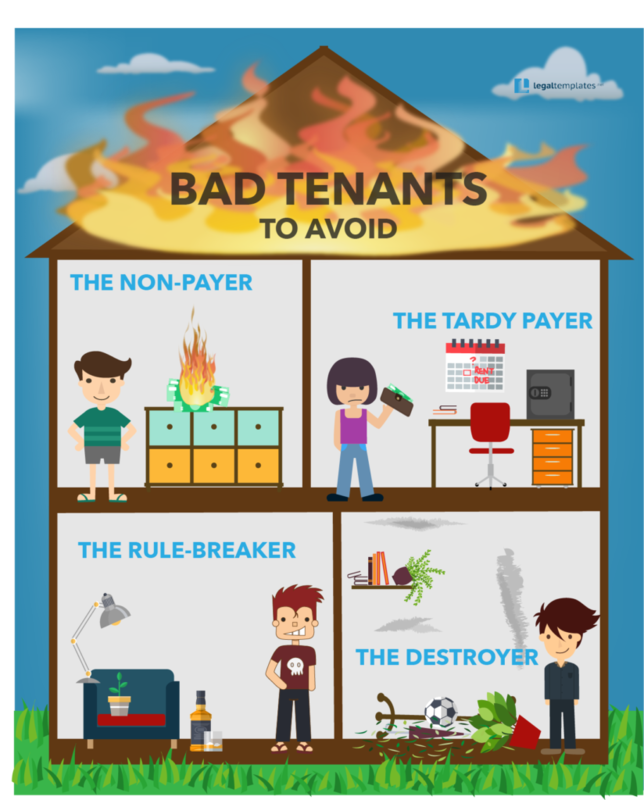 Whether you are a tenant or a landlord, here are some types of tenants to avoid (or avoid being!). Here you have your classic bad tenant. The one that ceases to abide by the lease agreement and fails to perform his monthly duty of writing out that rent check. After missed phone calls and ignored knocks on the door, the landlord devotes himself restlessly to acquire that check from you. Of course, there could be many explanations for why a tenant is unable to pay his rent. But nonetheless, if they agreed to the conditions of your lease agreement this means they are liable for these payments. Unfortunately for the landlord, these missed payments can simply add up as sunk costs. Find every method possible to get in contact with them. Try to find their workplace phone, their relatives, or even their friends. Find out what their situation is and why they are not paying rent. Send a text message, email, or call them first to arrange a meetup. If you are a landlord that lives close by, approach them to have a face-to-face confrontation. You’ll need to send a message giving “reasonable notice” that you’ll be arriving, at least 24 hours in advance. Give yourself plenty of extra time just be safe, however. Go in and check the premises, but don’t be rude. Does it seem like they’ve been gone for a long time? Have they cleared out entirely? If it has been a long time and the tenant has not made any rental payments, including late fees incurred, it is advisable to have a face-to-face discussion with the tenant. You should discuss the legal consequences if they continue to default on rental payments. Let it be clear that one of these consequences could be having them evicted. Once the problem of not paying rent is realistic in their eyes, then they will be more likely to take action for their responsibilities. Are you financially capable of paying rent? Depending on the conditions of the agreement, if you are evicting the tenant and they haven’t paid last month’s rent, then you have the right to keep the security deposit as a monetary compensation for the loss. Next, you have a slightly better version of the Non-Paying Tenant. Sure, the Tardy Payer might not pay his rent on time. He might not even answer the landlord’s messages. But at the end of the day, he delivers what’s most important, and that is their rent. Sometimes these delayed payments could really affect the landlord’s impression of the tenant. In your lease agreement, it should state the monthly deadline or the number of days the tenant has until to make their rental payments. As a legal contract, the tenant is legally bound to abide by these guidelines. Your lease agreement might have stated any possible fees for paying late, however your tenant may not have even bothered to pay either the rent or the late fees. The lack of punctuality makes it difficult for the landlord to balance budgets and positions the tenant as untrustworthy. Though the tenant is still paying rent, their delay in paying is still good enough reason for the landlord to acquire an eviction notice form or even a late rent notice. What is the cause of your delay in payment? Do you understand that as outlined in the lease agreement, your rental repayments are due on a certain date each month? Are you financially capable to make rent payments on time? After clarifying these points with your tenant, review the lease agreement with them again. Depending on whether it was a one time occurrence or a persistent ongoing issue, use your own discretion on whether to give your tenant another chance to pay on time, or be merciful with your late rent fees. There are always guidelines to follow as a tenant, whether it’s abiding by the lease agreement or set of rules given by the property manager. You’d think that once legally binding documents are signed by both parties, tenants would think twice about breaking the rules. However, sometimes tenants may feel they have a little bit of leeway to discreetly break the rules without letting anyone know. For example, the landlord may have a strict “no pets” policy, but who else is to stop the tenant from fulfilling their pet-owning dream? The landlord may not even realize the tenant is violating the policies of the property until perhaps weeks later when the apartment is filled with the odor of cats. Another scenario can be that the landlord forbids subleasing, yet the tenant still subleases the unit to another person. This can result in legal consequences for both the landlord and the tenant, which is not a situation anyone wants to be in. As a landlord, usually it would be difficult to ascertain if the rules are broken within the property unless you stop by to check out the property every now and then. However, when it is discovered they’re breaking the rules, you will need to address the situation accordingly. Confronting these issues with your tenant is the first step to resolution. Is there an alternative solution for what the tenant is doing? Is it necessary to create another addendum to add to the lease, such as a pet addendum or smoking addendum? For any property destroyed, be sure that the tenant is held liable and pays for it. Review the lease agreement and enforce the rules and responsibilities. Make any necessary clarifications. If the tenant resides with other roommates, talk to them to see if they could help out with the residential lifestyle and enforce the rules. You can even suggest a roommate agreement to see if that would help the process. This is the tenant that damages and destroys property, whether intentionally or unintentionally. There are several accounts out there where the tenant deliberately damages property regularly, bringing horrors to the people in real estate. This type of tenant can cost the landlord hundreds of dollars out of pocket just to fix and repair the damages. Is the tenant able to pay for and repair the damages? Explore the possible ways to prevent such occurrences from happening.What was the reason for the damage? Did the tenant set the house on fire again? Do they always leave the stove on? Did they burn the garden down after a BBQ party? Why are they breaking the window glasses? Why is this occurring and how can you prevent it from happening again? Should the tenant buy renter’s insurance? While you can’t evict a tenant without a legally valid reason, the lease agreement serves as a key legally binding document, outlining the rules of the tenancy for both the landlord and the tenant. What can you do as the landlord? Conduct a background check on the prospective tenant. You can do so by using an application for prospective tenants to screen prospective tenants and weed out the bad ones. Ensure the tenant signs a lease agreement to enforce written guidelines and expectations for both parties. As a landlord, you may not always know what kind of tenants you will be dealing with until later on in the leasing process. Remember to always clearly state the expectations of the tenancy and outline the consequences of breaking the rules in the lease agreement. As it is a legally binding document, it can guide and protect any situation you are dealing with. Don’t want to handle the eviction process yourself? Consider hiring a Property Management Company to do it for you. Read up on the Top 5 Reasons Landlords Should Hire a Property Management Company. What can you do as the tenant? Be sure to look over your lease agreement and abide by the stated guidelines and rules. There can be legal consequences and heavy fees involved should you decide to play the role of a Non-Payer, Tardy Payer, Rule-Breaker or Destroyer type of tenant. So be responsible and prudent. The rental property is your home, but it is not yours to destroy or take advantage of. If you have any doubts or questions, always make sure to communicate with your landlord to prevent any misunderstandings.